The example we're sharing below is a real-life implementation submitted by an Anveo customer. It is just one of many ways our customers have automated the order verification/confirmation process using Anveo API and Anveo IVR Call Flow engine. 1. The customer placing an order online is asked to provide a phone number for order confirmation. 2. The customer is shown a verification/confirmation code on their screen and then receives an automated phone call. 3. The customer is asked to enter the verification code shown on the screen. 4. After entering the correct code, the customer is asked to state his/her first and last name while the customer's voice is recorded. 5. The recording is stored for later use (e.g. for order dispute resolution). 6. After the customer successfully completes this order verification/confirmation step, the order is accepted and can be processed. The Anveo customer explains their implementation below. On the web server, a custom URL application was created to receive HTTP requests from the Call Flow. During the checkout process we collect the customer's phone number. Our checkout application initiates Anveo's DIAL.CALLFLOW API Request to automatically call the customer at the specified phone number and to initiate the Phone Order Verification Call Flow. As part of the API request we submit two variables, ORDERID and VALIDCODE, used to identify the order and to validate the verification code respectively. 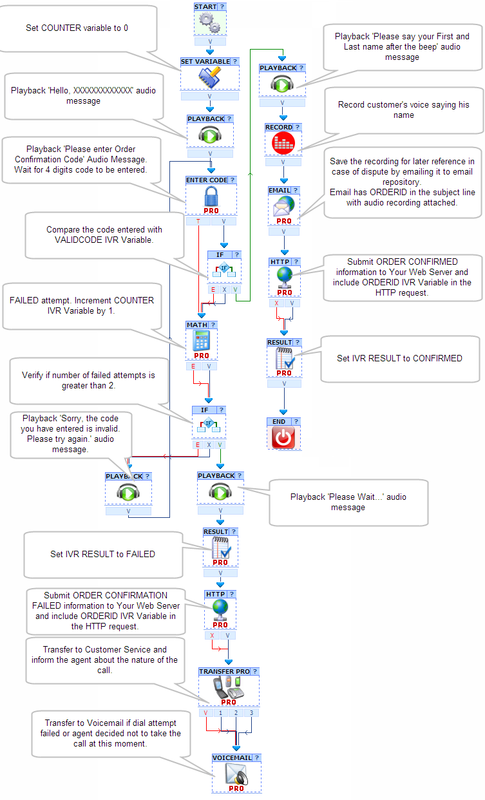 Call Flow handles customer call interaction and initiates HTTP integration to communicate SUCCSESS or FAILURE status to the web server. Customer's voice recording is sent via email for later retrieval. If customer fails after 3 attempts to enter a valid code, he/she is transferred to our customer support line to resolve the issue manually.